I love popcorn. If it’s the microwavable kind, I enjoy the the 94% fat free kind. 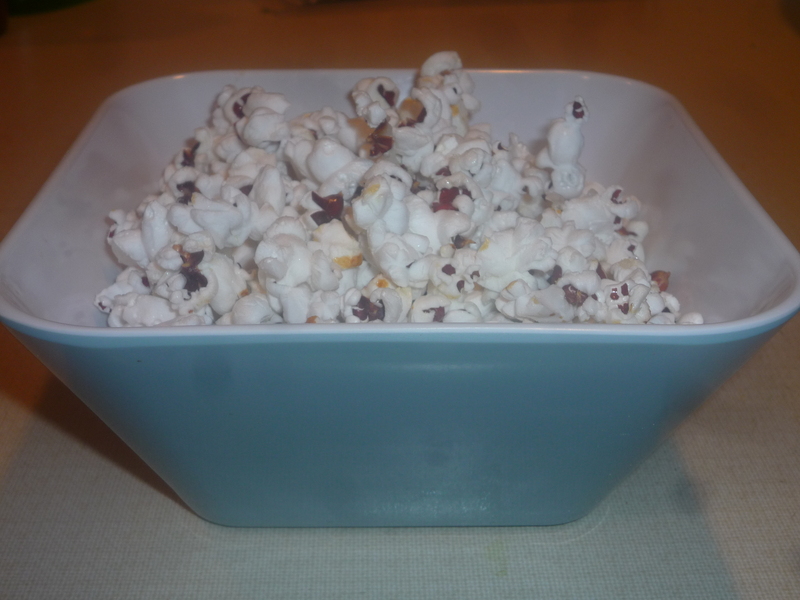 If it’s stove-top, I like black rice popcorn (and I have to admit I add way too much salt). Until 3 years ago, I never craved kettle corn. Popcorn, I thought, should be salty. Not sweet. However, the boyfriend is addicted to kettle corn and now I am too. I am enjoying a quiet night in tonight all by myself and of course the pantry is out of kettle corn! My attempt to make stove-top kettle corn: SUCCESS! In a medium sized saucepan put the 2 tablespoons of olive oil and kernels in the pan and sprinkle the sugar on top. Put the lid on top and turn the heat onto Medium/High. Wait for the magic to begin! You can shake the pan a bit to make the seeds sink to the bottom in order to pop. Listen for the popping and when it starts slowing down, take it off the burner. Dump it into a bowl (carefully because the sugar is hot!) and eat it up. Not sweet enough? Sprinkle a little more sugar (or Splenda) on top!